Great for breakfast meetings and brunch parties, this Polar Pak 02086 clear plastic hinged cupcake / muffin container can hold four 5 oz. cupcakes or muffins! Whether you choose four of the same flavor, or mix and match popular choices, this container's crystal clear appearance allows you to showcase your baked goods with eye-catching displays. Furthermore, the container's efficient design enables your bakery or grocery store's customers to select baked goods and carry them home with ease. These 4 compartment containers are perfect for transporting your treats. My customers are always complimenting me and in awe when I deliver cupcakes in them. If you are thinking about ordering these...please do! These are so perfect for anyone that want to use a different variety of things, for instance I use these to sell four different types of cupcakes instead of one . These are one of my favorites!! Great cupcake containers, holds 4 cupcakes perfectly and if your cupcakes aren’t real high you can get 6 I with no problem. Will definitely be buying more. Love love love these tins. They work great for Me to do a sampler flavor kit of my top flavors and send the couple on their way to test the flavors. Perfect for bakeries or convience stores, you can put a variety of muffins and has a great display, price is a bit high but makes a great sales pitch. Love these cupcake containers! These containers are perfect to package my soap cupcakes! They snuggle in nicely and hold in place for traveling or shipping. As with the other containers I've purchased of the same brand, they are absolutely fantastic. The price and quality can't be beat. I'm a huge fan! I have ordered these in the past and just recently. I also have the 6 count and 12 count containers I love these I make cupcakes all the time as a hobbie and for bake sales and for my sons classroom for holidays and birthday parties. They hold up well and make it easy to carry without worrying if the cupcakes will slide around. These hold 5 ounce cupcakes, so you can use a variety of disher sizes to fill your jumbo cupcakes or muffins. I use Avery labels to decorate mine and will decorate with ribbons or bows to give as gifts. The polar pak muffin container works great for the jumbo muffins. it displays the muffins well and the lid snaps on tight- its not air tight be it does keep them fresh for a couple days. This is an outstanding packaging solution for four-pack cupcakes or muffins. The snap mechanism is very easy and seals well. I like that you can stack them. This is the same exact quality as you would find in the grocery stores. It is also perfect for the transport of large cupcakes too! We love the option to have a four pack for our cupcakes. The only drawback of this set of Polar Pak containers is that the compartment size is slightly larger so a standard sized cupcake has the risk of tipping if you are not careful. Would love to see Polar Pak make a set that fit a standard size similar to their 6pk and 12pk options. Jumbo, jumBo, JUMBO! That's the size of these containers! Work great for the large muffins or treats. Seals nice but flimsy can break when reopening. These Polar Pak 02086 4 Compartment Clear OPS Hinged Cupcake / Muffin Container - 10/Pack are very nice and they won't crack that easily when you trying to close them. These containers are great for your kids packing homemade muffins or cupcakes to take back to college. It protects them from getting damaged or smashed. I love having the option to offer my cupcakes in various portions. The container is a bit big though for standard cupcakes so they don't fit securely but they still accomplish the job. They don't sit as loosely as some other "cupcake" containers do, so that's a plus. Great to have for the price listed. We use thes often but they are a little wide at the bottom so standard size cupcakes will move around a little. But they are still good . These are perfect for my jumbo size cupcakes. They have the High hinged top so that way nothing will get smashed, and it also gives you plenty of room for them as well. They are very sturdy which makes transporting easy and it's not flimsy at all. Amazing and Great Quality! 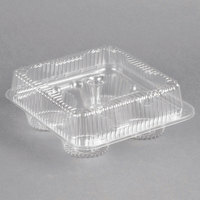 The Polar Pak 02086 4 Compartment Clear OPS Hinged Cupcake / Muffin Containers work really well for home use. I made cupcakes for my daughter to take to school on her birthday and these came in very handy. The quality is good and stayed closed. I definitely recommend these containers. These are perfect for my cupcakes! They have the High hinge top so that way nothing will get smashed. It gives you plenty of room . Great Quality! These are a good quality container. Three stars because they're labeled as cupcake, but they do not hold standard cupcakes well. I'd definitely say these are for muffins or jumbo cupcakes. great strong material, easy to open, does not break after first open. great for display so customers can see your item. great for cupcakes, muffins and Russian korzinki. These are great containers but not realizing the size I won't be able to use them for regular cupcakes but they would be great for jumbo cupcakes or muffins. They will definitely be used! These are nice quality containers. They ended up not working for what I had ordered them for because I was looking for something to hold standard size cupcakes, and these boxes hold the jumbo ones, but they are nice containers and the jumbo ones fit nicely. These containers are the perfect size to serve a variety of flavors. I like them for cupcakes and/or mini bundt cakes. The sturdy construction make transporting easy. These are good quality, but be sure you read the full details carefully!! The listing heading doesn't specify size, so I assumed they were a standard cupcake sized container. When I received them, they are actually for jumbo cupcakes! When I went to the listing to check what happened, it does state in the description section that it's for the larger cupcakes. But, it should be in he heading like all the others, in my opinion, to avoid this costly mistake. We love these containers for our cupcakes! They have high enough lids that the icing doesn't get messed up and they are easy to open and close. This container works perfect for our large cupcakes we sell in our shop! We will definitely be ordering again. Short delivery time is great too. Great quality, great size ( fits our large muffins ). Great way to display product at local market. Our cupcakes also fit well in theses containers. Although the containers are nice and sturdy, please be aware these containers are for JUMBO cupcakes and muffins. Standard sized cupcakes will shift around in these containers and if you have cupcakes with decorations on them you'll risk the icing or decorations being ruined. I would suggest the description be updated to indicate these are for Jumbo cupcakes and muffins. We ended up returning these and was subject to paying shipping and a 30% restocking fee. Thank you for the review! We're sorry these did not work for your product! For your convenience, We do list the compartment dimensions in the content. These muffin containers are large enough for jumbo muffins. We try to limit the number of containers that we use in our shop, so these work perfectly for medium and large muffins and cupcakes. If you make your cupcakes very tall, they may not fit. We stay away from lots of frosting. I bought these for muffins and am somewhat disappointed that they are too big for my regular sized muffins. They seem a bit thin as well. I love being able to offer multiple sizes of containers for customers to grab their cupcakes in. While most order by the half dzn or dzn, several also order just 3-4 and it was such a waste giving them a half filled 6 count container. These are very sturdy 4 count Muffin containers. These are great for jumbo muffins or cupcakes, but will not fit standard size cupcakes very snug. Wonderful way for us to display our cupcakes and muffins. We were putting them in our rear open display as singles. They would tip over and it was a mess. This is perfect on all levels, display, selling at 4 pack price and costumer convince. I have not used these yet but they arrived fast, they look quite nice, when i use them i will post a video and picture. Absolutely love this product! Love how you can put your adorable cupcakes on display with them covered! Very good quality! Defiantly be ordering this product again! These are nice but... The product is great - very clear plastic for good visibility, sturdy, easy to open, etc. but it would be great if the description on the site was clearer about the sizing. These are for 'jumbo' cupcakes or muffins. Unfortunately, I was already selling product at a show before I realized this, my standard sized cupcakes were shifting in the wells a little too much for my liking. I'm a little disappointed, but it could totally be my own fault. It said cupcake container in the description, but these are really for a treat that has a much larger base. My cupcakes were very loose in each well. I won't be ordering this size again. I like this muffin container for small quantities. The slots are slightly larger than the 6 and 12 pack versions, so it will hold a jumbo muffin with no problem. Will buy again. This is a great product when baking jumbo cupcakes probably to big for standard. Durable and easy to use. I wish they made 12 or 24 holder. This is a lovely container for cupcakes. I am totally obsessed with it. I will definitely buy this again. Cupcakes fit perfectly... Lovely! The cover also closes nicely. Did not like this container at all. I got used to the Douglas brand which fitted my cupcakes perfectly. These look more like they're for giant cupcakes and not regular size. This container's compartments are huge and the cupcakes move within, making it an inconvenience when it needs to remain still so the toping(s)/decoration(s) don't fall. Ordered it after seeing that my usual brand was no longer available, but will not buy again. Thank you for the review! We are sorry these containers were too large for your cupcakes. We recommend trying these 4 Compartment Clear Hinged High Dome Cupcake Containers instead for a slightly smaller solution. Excellent for small orders, have a wide opening at the bottom therefore muffins or cupcakes fit nicely without being damaged. Once closed these do not open. These containers are awesome - Super cheap and very secure. Thew tabs get stuck sometimes and are hard to pop into place but its not enough to deter me from ordering these again. Really great product for the price. Great container! Didn't fit my need for what I ordered it for. Each cavity was bigger than a standard cupcake. But worked PERFECT for my jumbo cupcakes and muffins. Will order again. We love this packaging at the farm! We sell lots of muffins and this package is so easy to use, closes well, and doesn't re-open easily - which is a key factor for people shopping at a farm stand who may not be very gentle with their items!! My 4 pack clear cupcake container was perfect! I make huge cupcakes with lots of frosting and these containers are great so the frosting doesn't get smooshed! You can see the whole cupcake and it is very enticing to customers! Great product and price! It has been so hard to find a container that fits cupcakes without smushing the icing on top. This container has been the best, closes well, and puts the product on dsisplay! I got these for my fiancé to take muffins to work. They are perfect. I was particularly excited to see them in packs of 10 (kudos webstaurant) and they work great. They're even stackable! Love love love these containers! They are easy to use and pretty sturdy! My only qualm is the reopening of the container. Once they're in, they're IN! You just have to get used to the way they reopen. Other than that, will purchases again. These boxes were okay, but the holes were too big and did not fit my cupcakes. I think this box would be better for just muffins or jumbo cupcakes but not a standard size cupcake.